This month you have probably not seen us around as much in the public eye at events and Community functions as it has been a quiet month in that area. It certainly has not been quiet behind the scenes with a great deal of development work occurring that will benefit us all in the longer term. We are building a new website with a full upgrade of the content and the look and feel will certainly be noticeable. 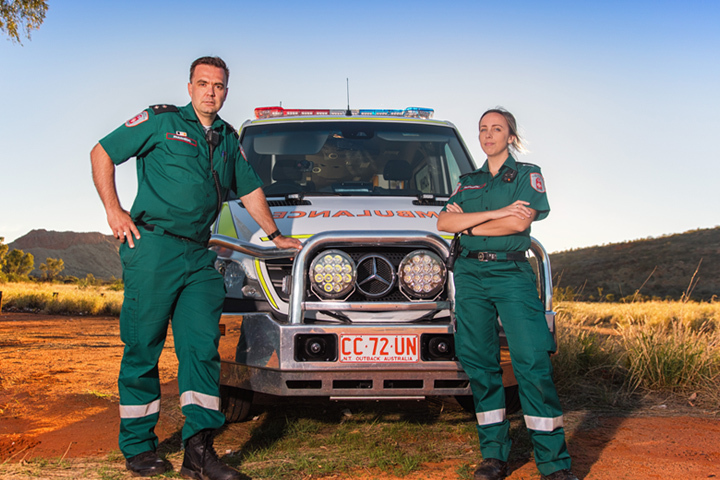 At St John National there is also a great deal of work happening in an attempt to have all States and Territories with a common look and feel as we strive to promote one Australian St John Ambulance. Our upgraded Website will link in with this and will be re-launched in the next couple of months. The documentation has been received on the funding support from the Australian Government Department of Infrastructure and Regional Development for the construction of the Alice Springs Volunteer and Training Centre that is to be located on the site directly behind the current Ambulance Centre. There is still some finalising to occur before the Deed is signed but it is planned that once signed, work will commence immediately for an end of April 2018 completion date. This is very exciting for us all and we acknowledge the great support of the Australian Government who, by partnering with St John Ambulance NT, will provide a fantastic facility for the people of Alice Springs. The Golf Day is getting closer and there is a huge amount of work happening at the moment to ensure the 5th of May event is a great success. It promises to be a top day and there is still a few teams and hole sponsor opportunities left so please come and join us in what is promising to be a most entertaining afternoon full of networking and fun. We are also working on a new promotional van that will provide excellent First Aid experiences with CPR and other practical first aid skills delivered through advanced technologies and equipment. We are working to have this vehicle ready for the Dry Season when we will again be present at all the major events across the Territory and any other Community outings we are requested to assist with. Please keep an eye out for our dedicated Volunteers who make their time available week in, week out at these events and go up and say hello – they would love it. Easter is fast approaching and we take this opportunity to wish you all the best for this time as you relax and enjoy family and friends. Drive safely if you are travelling and a happy Easter to you all. St John would like to thank ABC Darwin for their generous support at the recent ABC open day in celebration of their 70th Birthday. Not only did we have a great day and met the ‘Bananas’ but our Darwin Cadet and Junior Division worked very hard at the sausage sizzle and managed to raise $700 which will go towards sending their members to the next NT cadet camp being held in June in Litchfield National Park. Well done to all involved. St John Ambulance was this month named the highest community blood donation group in the Northern Territory at the Australian Red Cross Blood Services’ annual Red25 awards presentation held in Darwin. St John Ambulance staff and volunteers made 41 donations last year as part of the Red25 annual challenge held by the Blood Service – saving the lives of 123 people needing blood products, including much needed plasma. Kormilda College came second and third in the Red25 Community Category for NT with respective blood donation tallies of 39 and 33 blood donations. Red 25 is the donation program of the Australian Red Cross Blood Service which aims to rally corporate, government and community organisations and groups together to achieve 25 per cent of the annual blood donations needed by Australians. The Blood Service is always in need of new donors to help combat seasonal donor shortages around long- weekends, Darwin’s wet season and Easter and Christmas. A great way to become a new donor this year is to start or join an existing Red25 group. Last year, 112 Red25 groups from Darwin made 3163 donations, collectively saving the lives of 9489 Australian patients needing blood products, including those suffering from cancer and blood diseases and blood loss through trauma, surgery and childbirth. Sponsorship spaces still available but they're selling up fast! We are almost on the final countdown to the golf day, with many generous Darwin businesses already on board and supporting the event. If you are not involved, it is not too late to be a part of Darwin’s largest golf day and the best networking event on the calendar. We only have a few hole and team spots left and a handful of teams to fill, so don’t miss out, give us a call today. Even if you can’t enter a team, we are still seeking prizes for the event. Don’t forget to follow our Facebook page as we introduce this year’s sponsors. Congratulations to Lynde-lou Schubert, winner of the e-newsletter signup competition for February. Lynde- lou has won a Personal Motoring First Aid kit valued at $38.50. Please pass our newsletter onto friends and colleagues and encourage them to join our mailing list, they will also go in the draw to win a Personal Motoring kit. One winner will be drawn each month.